This specimen was scanned by Jessie Maisano on 8-9 June 2011 along the coronal axis for a total of 12,387 slices with a resolution of 5.29 microns. To cite this page: Dr. Gabriela Parra-Olea, Sean M. Rovito, Mario García-París, Jessica A. Maisano, David B. Wake and James Hanken, 2016, "Thorius longicaudus" (On-line), Digital Morphology. 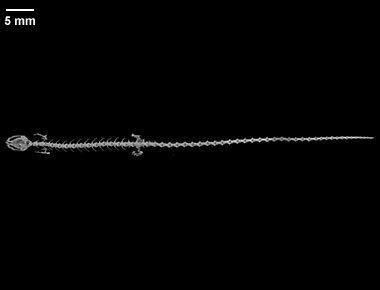 Accessed April 19, 2019 at http://digimorph.org/specimens/Thorius_longicaudus/whole/.